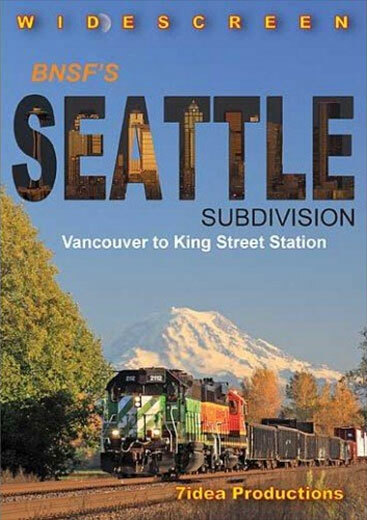 BNSF�s Seattle Subdivision is one of the busiest rail lines in the Pacific Northwest. BNSF and Union Pacific polish the rails with a great variety of unit trains plus intermodal, mixed merchandise, and many locals.In addition to freight traffic, the busy subdivision hosts ten Amtrak trains: four Cascades each direction, plus the north and southbound Coast Starlight. Between Tacoma and Seattle, Sounder commuter trains are also added to the mix. See this beautiful line between Vancouver, Washington and Seattle�s King Street Station. 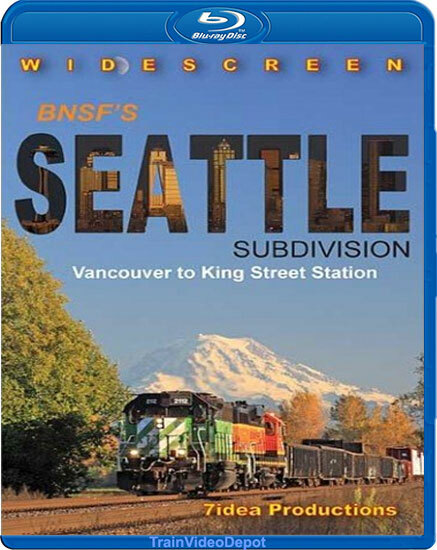 Shot in the summer and fall of 2017, see why BNSF�s Seattle Subdivision is truly a railfan�s paradise! Curt Cruthirds (Santa Barbara) on 2018-12-10 21:13:05. To be very candid, while I have virtually all of 7idea's releases, for some reason I was holding off on purchasing this one. While the scenery was appealing, I know that my reluctance had to with the volume of passenger train footage that was included, as I am a die-hard freight fan. Well, I am glad that I pulled the trigger and made the purchase. Quite honestly, I think that with any release from 7idea, you won't be disappointed. As with all of Aaron's dvd's, the scenery is outstanding, the camera work and video-quality is the best around, and the use of maps makes for an enjoyable journey from Vancouver to Seattle . But, the extensive footage around the Puget Sound area, with trains riding the rocky shoreline, was a highlight for me. In short, while not my favorite from 7 idea, I was still happy to add it to my collection. dmacleo (Etna ME US) on 2017-12-31 08:37:00.
really good camera shots (eg. bridges include ships) as well as informative narrative that cover the history w/o bogging the viewer down with minutia. while I am a freight fan usually I found the passenger train info pertinent and it tied into the subject well as a whole. 'a well rounded subject mster.